Vineyard Operations & the Winemaking Process is a Lot of Hard Work, but it’s Worth It! I live in Redding, California and I like small talk. You know…. Like chatting with the person standing beside me in the grocery line or your food server at lunch or another patron from Red Bluff who is sitting across from you at the local pub when I visit Chico. People fascinate me. You never know who you will meet next and how they may enlighten you, or speak to your soul or just simply share a recipe with you that seems brilliant enough to try and your family loves. Sometimes in these casual conversations about Winemaking Styles, types of Grapes, Red Wine, White Wine or what it is like owning a winery will happen to come up. Without fail, the reaction is the same, each and every time. Owning a boutique winery requires that you are an expert in Winemaking Styles and every possible form of the Winemaking Process step by step of the business: Farming, Equipment Mechanic, Scientist, artist, Manufacturing Facility Operations, Equipment and Production, Social Media and Marketing Guru, Special Events Coordinator: Planning & Executing, Greeter & Smiling Host; Event Set up and Break Down facilitator; Warehouse & Distribution Operations; Bookkeeper and Back Office Manager, TTB Specialist, ABC Specialist… Quality Control Specialist is (of course) on the list as well… but that job is usually done at the end of an 18 hour day… Enjoying the sunset and puffin on a Padron. You get the idea, Right? We charge a modest fee of five dollars to taste our wines. However, if you purchase a bottle the five dollars will be discounted from your purchase. We typically have all our wines available for tasting. 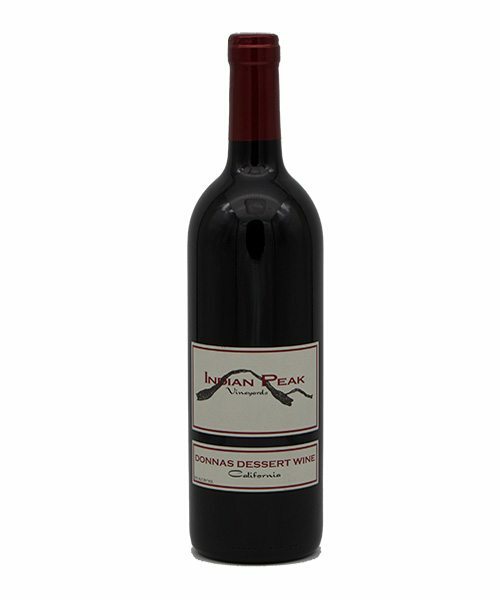 You will receive a small pour (about 1.5 ounces) of each one of our varietals, finishing with our signature dessert wine; Donna’s Dessert which includes a dark chocolate truffle. Fred made this special wine for his wife Donna. This is a unique sweet wine, like a ruby port, that’s not too heavy or syrupy and not to sticky sweet. This wine is decadent and will sneak up on you…. It might even get you into some trouble, if you’re not careful! We usually have a lunch menu available on the weekends. The menu is a limited and simple “one” option that changes every weekend. Regardless of what’s being served for lunch, one thing is for sure… You will be served the best quality ingredients and with portions generous enough to split between two. You can look forward to tasting our coveted Chicken Chardonnay soup or get messy with Meatball Sliders or build your own taco bar. The first day in January is the same for us every year. We are cleaning up from the party we threw the night before. Although we call it a New Year’s Eve Party… I am pretty sure it is how Fred makes sure he can drink a little more, smoke a little more and enjoy a delicious meal on his birthday. Since we understand that most people have somewhere else they prefer to be – well before midnight – we like to start this event a little earlier than most. Live music, a huge fire pit made from an old marine buoy; a custom gift made by students at a local high school metal shop. Obviously, the instructor was quite fond of our winery. Winter is generally our slowest production time of the year. This is a great time of year for a visit to the winery. You can count on a warm welcome greeting upon arrival… Fred, the owner and Master Winemaker, usually breaks the ice with a little humor, by introducing himself as the man who does it all, “I’m even the janitor” he will lightheartedly admit. Fred is almost always the person behind the bar pouring wine for our wine tasting room guests. Grab a wine glass and buckle your seatbelt… You are going for a ride. Here comes a plethora of information! We offer mostly red wines, and a small lot of Sauvignon Blanc. Fred personally tends to each plant, several times throughout the year. We have 7 acres planted with grapes: Cabernet Sauvignon, Merlot, Pinot and Sauvignon Blanc are the bulk of our vines. We also have a few rows of Cab Franc, Malbec and Petit Verdot. They pair wonderfully together. Check our calendar in early February and plan to attend our annual Chocolate and Wine weekend. We put on a pretty elaborate spread of deliciousness… Starting with a well thought out lunch menu for the special weekend. But you absolutely must save room for dessert; a delectable dark chocolate fountain, with tons of goodies for dipping; Fresh Strawberries, Rice Krispy Treats, Angel Food Cake, Marshmallows, Bananas, Cream Puffs, Pretzels… Brownies, and? – anything else that we think up! Actually, spring is beautiful everywhere in Northern California. The hills are covered in a fresh green. You can see the snowcapped mountain tops of Mt Lassen and Mt Shasta, depending on which direction you are traveling. Creeks and streams are full and flowing fresh snow melted water. Wildflowers are in bloom. As you are headed up to our vineyard, we are the first driveway on the right after the church and the grange. You can’t miss our big metal winery building as it sits high up on a hill with rows of vines uniformly decorating the hillside. As April turns into May, the gnarly twisted grape vines, that were just barren from the winter, begin to sprout little buds. The Manton Valley is blanketed with beautiful shade of fresh green everywhere. This time of year, is ideal for hanging around in the early evening watching the sun go down behind the western mountain tops. A good solid week or two of warm sunshine is all it takes for the vineyard to Spring Back to life. Once it stays sunny and warm, we will have work every day in the vineyard suckering, tucking and thinning each vine. As the days grow longer, the temperature rises and the sunsets are cool. Creating an ideal environment for the fruit on the vines, also know as grapes to ripen. If you are looking for the answer to the questions, “How do you make wine?“, bottling the wine is the fun experience that brings making wine all together and is a MUST do, if you’re a wine drinker and want to see how the winemaking production works. We prepare lunch…. and who knows, you may be sent home with a special treat. August is hot in Manton, which is exactly what the vines like. We test the brix fermentation regularly and just like with Chinese Tea leaves, we can see what our future holds for a harvest date. It really is all up to the fruit. Every year before we begin to harvest, we have a local group of Monks that come to bless our vineyard. The Monks are all business as they set up, bless the fruit, wine making and break down, all in less than 30 minutes. Then off to the next vineyard they go. We appreciate any and all blessings we can get. 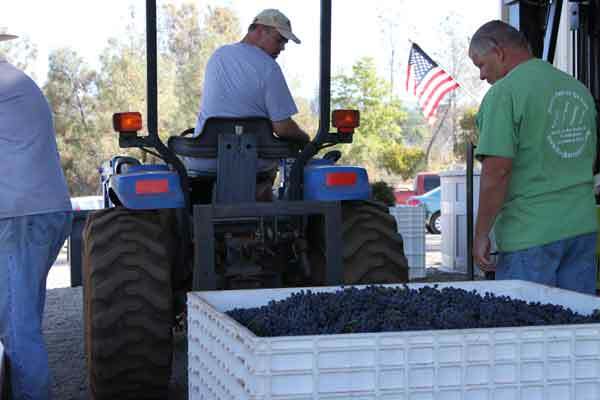 Once this big winemaking production begins, it is a steady pace of pickin’ & weighin’ each load of fruit. The whole process takes about a week and a half. Sometimes we have customers ask if they can come and pick a little bit of leftover grapes so they can try a hand at their own winemaking skills. Fred has plenty of winemaking knowledge, so if you are looking for help, he is the guy to ask. Our biggest event of the year is our Annual Harvest Party. Once all the fruit has been picked, we celebrate with huge party. This is such a popular event, better pick up tickets early, or they may be gone! You can look forward to stomping grapes, eating good food, and dancing. Maybe even a horse drawn carriage ride! In the Fall, Manton Valley is filled with colors; gorgeous oranges, brilliant reds and bright yellows. This is also a wonderful time of year to visit. The blazing hot summer fades away and the temperature drops. Nights are even a little chilly. Bring a light sweater or jacket if you’re planning a trip up. The first Saturday in October, is the Manton Apple Festival. This is a pretty well-known event. Vendors fill up their grassy spots down at the school with all kinds of arts and crafts and anything and everything Apple. Apple Fritters, Apple Pies, Apple Cider, Caramel Apples, Cases of Apples…. Definitely stop by for some Wine Tasting and enjoy a glass of wine when you’re in town for the Apple Festival. Whatever time of year in our Winemaking Process, when you stop in for a visit at the winery, you will be welcomed and treated just like one of our family. Please take a moment to share a Review of Your Experience at our Winery! Thank You in Advance for Sharing Your Review!